If your anywhere near Dungeness in the next two weeks..
Well 2009 seems to have started really well. The opportunity to hold exhibitions is coming in thick and fast. I have 2 booked for 2010 and I am on to my first exhibition this year already. From February 1st to14th my work will be part of an Exhibition at RSPB Dungeness with Darren Chaplin, Martin Eldridge and Kevin Goodchild. It really is a privilege to be exhibiting with such good photographers. If you are down that way then why not pay it a visit? Well I have managed to stick to one of my New Years Resolutions (from last year) - I suppose there is a first time for everything! My resolution was to get more organised. There were hundreds of things that I had promised people, decided to do or needed to be done and I was drowning in a sea of disorganisation. I would spend whole weekends doing things that weren't particularly important and then realise that I should have been doing something else. What I needed was to get myself organised. What I needed to do was get a jobs to do list organized, prioritise it, add diary entries for repeating items and generally sort out what I should be doing when. I found the ideal tool for this: RememberTheMilk.com. RTM (as it's known to its friends) is a brilliantly simple application for managing your todo list. First thing I did was to go through, all the emails I had marked, notes I had written, things in my head and add them as a list of things to do. Next I added any repetitions, for instance I like to archive off my work once a month, check my backups once a month, and put the rubbish out every week. Finally I marked the tasks that were important. Now it is simply a question of adding dates in to do things, I like the way the system takes entries like "Wednesday", "next thursday", "2 weeks" and a whole host of similar entries. Each week I shuffle round all the things to do so I hit whatever deadlines I have. So what makes it so much better than a paper list or any of the various other options. Well I like the fact that I can have my todo list wherever I need it. I have it showing on my Netvibes page, any web browser I can get to, I can use it off-line on my laptop thanks to Google Gears, and even on my mobile all for free. The second feature I like is that your todo list comes with it's own (hard for spammers to guess) email address. Forward an email to this and it becomes a task. So when an order comes in from my website I have a rule set up in my email client that automatically forwards the order onto my todo list as a high priority task. I can also have shared todo lists wih my wife, so we can see which jobs we need to tell each other to do. It's a really useful bit of software and it's free..we like that. A big thank you to Blab Pictures who have made me their Tog of the Week. 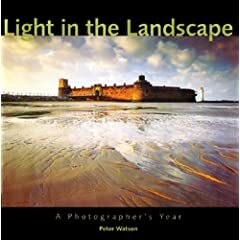 I have been reading one of my Christmas Presents: Light in the Landscape - A Photographers Year by Peter Watson and very good it is too. I must warn those of a nervous disposition that the book is a few years old now and all the shots were taken on film. The past, as they say, is a different country...they do things differently there. But amazingly the constant use of words like "Velvia" do not detract from the book. What I liked about it, was that it talks about the ups and downs of getting the shot in a way that I completely recognise. Not just the usual comments you find in Landscape togs books about pre-visualising the scene and waiting a week for the light to be right. In this book Peter admits making mistakes, not being completely happy with compositions and even racing up and down the side of a loch then clambering over a load of brambles in an attempt to catch the light at the end of the day. Some times he lucks out & gets 2 good shots within 20 minutes of each other, other times he gets a shot but is not completely happy with it. This is more like the landscape photography I recognise. The book works through a year of photographs week by week. Each photo is accompanied by a description and some technical information about it. I feel I will keep this on my bookshelf to give me something to look at when I am wondering what to photograph. I, like many photographers using Canon kit have been eagerly anticipating the replacement camera for the Canon 5D. The 5d had been around for a lot longer than most cameras for two main reasons: it was a good design and it had little competition. I wanted one but it hardly seemed worth buying one if Canon were going to bring out a replacement model as soon as I bought it. Finally Canon announced and released before Christmas the cunningly named Canon 5DmkII. The main attractions of the new camera for me was 21 mega-pixies*, integrated cleaning system and most of all full-frame. Live view is an added bonus as it is something I really miss from my days of using a Fuji S602, I don't often shoot using the back as a viewfinder but it can be really handy when setting up a tripod in awkward positions. Apparently it also can shoot HD movies but I doubt I will be using that. Well it arrived on Friday; I had a quick play after it arrived, then a few shots on a dull Saturday. Sunday morning I had agreed to meet up with with two fellow Essex photographers, Kevin Goodchild & Clive Burrow. Kevin had recommended Thorpe Bay in Southend, we got there well before the dawn and the light was fantastic. So what is the verdict on the 5D? The big viewfinder is great, it is bright and clear, I actually feel like I can see what the picture will be. The 20D viewfinder seems a bit dark and vague in comparison! The other unexpected feature I like is that when you press the focus selector button twice the back displays all the shooting info: mode, exposure, bracketing, wb, ISO. Even better you can change them there too. Hopefully that should save me mornings of shooting at ISO3200 with a florescent white balance. The only downside so far is that I have had to change to 8bit tiffs as the file sizes for 16bit tiffs were so huge that Photoshop and Capture One ground my PC to a halt. Though with 8bits everything seems back to speed. * Mega-pixies are the small creatures who live in the camera. When you open the shutter they quickly view the scene and make a sketch of it. Obviously the more pixies you have the less sketching each needs to do - giving them more time to make a better job of it. I've just updated my gallery of images from central London - London Light/London Life. I wasa bit tardy on this project last year, one of my new years resolutions is to get out in to London and do a bit more shooting. Hope you enjoy the shots. This week sees two more examples of photographers being detained and searched under our wonderful anti-terror legislation. First an MP gets stopped for photographing a cycle path in Croydon (a more unlikely terrorist target it is hard to imagine) and an Artist gets detained for taking some shots near a police station. How long before new cameras come with a list of places you can use them? Well I'm back now from spending a lovely refreshing break in Devon for the New Year. We had a cottage right on the beach at North Hallsands. The weather was fun with no rain, but the storms lashed the beach making it easy to see why there is only North Hallsands - South Hallsands disappeared in a storm in 1917. The whole area of The South Hams is very beautiful and it's so tranquil at this time of year it is hard to believe that Start Bay was once the location for thousands of American Soldiers and Sailors to practice the D-Day landing. Unfortunately many perished off Slapton Sands in Operation Tiger and the memorial to them (a recovered Sherman DD tank) is rather moving. Start Bay ends in Start Point with its own delightful Lighthouse. I was there very early and when I got out the car a fox was sitting looking at me, it's always good to have company on a shoot. I found my way down the rocky outcrop overlooking the light house and I'm rather pleased with the resulting shot. All in all a good weeks break and a great start to the new year. I just love the work of Lou Raizin, he has a great abstract/graphical style that he uses to produce the most stunning images. His website is a not to be missed treat for the eyes. I would just like to wish all my readers a happy new year. I hope everyone has a great 2009.